In February I noticed that I could no longer access the EU Commission’s website using a VPN service. Most TOR servers and VPN services turned out to have been blocked, preventing millions of users from accessing essential official information. The blocking affected even the European Court of Justice’s website which provides access to the Court’s jurisprudence. 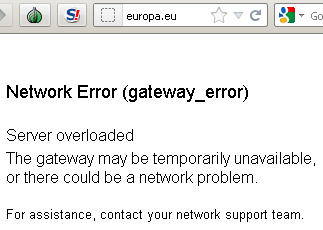 I have come to notice that the Commission’s website ec.europa.eu is no longer accessible using VPN services (error message: „Access Denied (policy_denied) Your system policy has denied access to the requested URL“). use a VPN service (http://www.vorratsdatenspeicherung.de/images/infas-umfrage.pdf). Despite this rebuke, the blocking was ended a few days later without further explanation. EU websites can once again be accessed anonymously. Obviously, blocking anonymity is not necessary to keep the websites available. The German Federal Crime Agency confirmed last year that „anonymization services are no longer an issue in the execution of DoS or DDoS attacks“. Just like other liberties, the freedom to remain anonymous is too beneficial to society to be given up in reaction to sporadic abuse. The benefits of anonymity have been explained in detail by Gary Marx („What’s in a name?“), the detriments of total traceability by AK Vorrat („Background information and facts“). To find out how to protect yourself, read our Comparative test of Internet Anonymizers. Elles aiment voir leur tête, quand elles disent non pour faire ce truc.